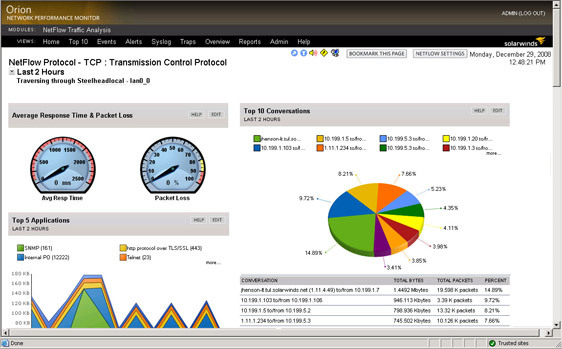 SolarWinds NetFlow Traffic Analyzer (NTA) - Symtrex Inc. Your network performance soars or suffers based on what users are doing. You’ve pleaded with employees to stop using the corporate network for bandwidth-hogging applications like streaming music and playing World of Warcraft®, but no one seems to care. You’ve been called out by upper management due to poor network performance more times than you’ve thought about attending Comic-Con®. You’ve enabled CBQoS to give higher priority to critical traffic like voice – but how do you know if these policies are effective? How can you analyze the traffic on your network so you can respond? Not to worry, SolarWinds have an answer. NetFlow Traffic Analyzer (NTA) enables you to capture data from continuous streams of network traffic and convert those raw numbers into easy-to-interpret charts and tables that quantify exactly how the corporate network is being used, by whom and for what purpose. And with CBQoS monitoring, you can be sure that the policies you’ve set give your mission-critical traffic the highest level of priority. SolarWinds make it easy to get a comprehensive view of your network traffic, find the bottlenecks, and shut down the bandwidth hogs.